A week or so ago I wrote a post here about the anticipation of having our adult children and their spouses come home for Christmas. Christmas is now behind us and they've left to go back to their own homes and lives....but not before I do a recap of what this family Christmas meant to me! The big lesson that Christmas has taught me is that everyone has their own set of expectations and you can't shove yours onto your children and expect that everyone will be happy. So, with time and pain and a readjustment or two (or three), this year Christmas was pretty darn good - as far as I was concerned anyway - and (judging from the picture I quickly snapped of them above) - it was good for them too. Expectations are the biggest cause of heartache for me - I need to be more realistic in what I want from family life. I think coming from a fairly dysfunctional family background has made me try too hard to make my own family fit my picture of "perfect". Letting go and letting our kids find their own balance has been a wonderfully freeing experience and this Christmas has been all the more relaxed and special because of it. So, my advice (not that I give advice), to parents struggling with the changes that adult children bring with them, is let go. Don't hold on too tightly, don't get your hopes too high, accept that you aren't the centre of their universe, and open yourself up to new ideas and compromises. 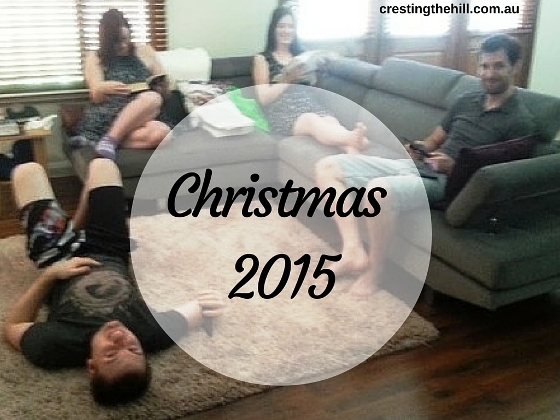 I think Boxing Day is going to be our "Christmas Day" and that's really fine. I'd rather have a relaxed and chilled out day or two somewhere around the Christmas season than a forced and stressed day that nobody really feels happy about. The kids are gone, peace has descended and I think we all had a lovely time - what more could a mother ask for? Who knows what Christmas 2016 holds? I'll just wait and see. What, no mention of the joys of having four cats under the one roof? I think Callie will be hiding until Easter from the stress of it all! I think you are on to a great compromise. The picture looks like everyone is relaxed! they were pretty chilled out Haralee - I tried really hard not to pile any more events onto them so when they were home they could relax. I think it went well! Ah we were on the other end this year with extended family expecting us to participate in their celebrations and we holding on to our traditional quiet Christmas at home. It's best that everyone gets space to celebrate the way you want. Glad you all had a good Christmas, Leanne. I totally agree with that quote. Expectations can be a joy killer - and for no reason! Happy holidays! It's a lesson I've been a bit slow learning Lois - but I'm getting there! I love that you have learned to let go. 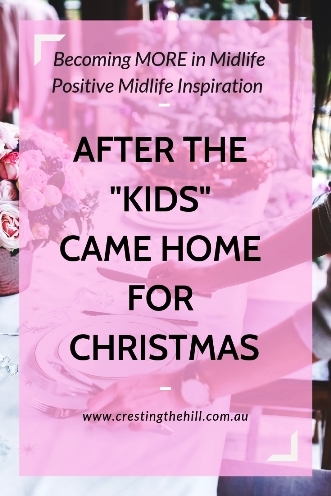 When my husband was in the military, we would not make it home often at all (He was hardly ever home for the holidays), and all of the expectations made our visits so stressful. There were many times I opted to spend holidays with friends when he was deployed, just to avoid the extra stress. Oh, Leanne, I'm so glad it went well! You are so right ... our expectations have the potential to ruin the best of things for us! I have enjoyed reading this post, you are right expectations are always troubling so it is better not to expect too much. expectations can be real killers and I'm coming to terms with that more and more. You are my role model for this stage of life. I'll be there soon, and this is such great advice. Glad you had a wonderful Christmas with your family! Thanks Sue - I can imagine that blended families have it even harder than we do. I just want everyone to be happy but there is that little voice always saying "what about me?" - this year I think we got it right. I totally get where you are coming from Leanne with 5 kids, 3 of them married, 6 grandkids, lots of extended family and trying to make everyone feel they have time to see who they want/everyone see whom they feel they should and me aka mom-grandma-daughter-wife spinning all the balls in the air while trying to feed the masses, clean up a bit (blog in between) and do emotional damage control of about all who come within 50 miles. It's a trick, but WE can do this right!?! At least get in a really good nap before the next gathering, lol. thanks Charlotte - I think we have fairytale ideas of perfect families and when we let those ideas go and embrace what we have in front of us we are truly blessed. It is quite an adjustment, learning to let go of your expectations. We used to have great times during the holidays until my boys had to move away and now it has never been the same. I found myself telling my girls that we have to make the time we spend together without the boys count as much. So I have to lower my expectations in a differnt way from you. We grow and adapt. Happy New Year to you and your family Leanne!! I'm glad you had such a great time Leanne! Happy New Year! I'm sure the house is much quieter now Leanne but not for long, soon you will have a little one running around. Again Leanne, I hear you on this, I'm actually feeling it with other holidays too. To compete with all the other relatives involved gets overwhelming for me. I'll admit, selfishly, I want them all at my house, my terms, my fun....my, my my.. Thanks for putting it all into the perpespective it needs to be in.